London (CNN Business) 1. 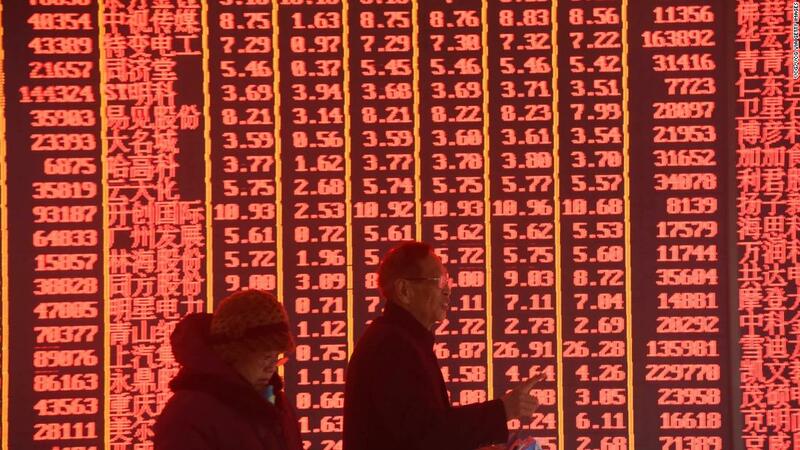 Back to business in China: Markets in mainland China zoomed higher Monday as investors returned from a week-long break for Lunar New Year. This is a big week in the trade conflict between the United States and China. Trump has threatened to increase existing tariffs and enact a third wave of penalties on Chinese goods if the two sides can’t broker a permanent truce before the March 1 deadline. 2. US government shutdown (round 2): The United States is facing another possible government shutdown later this week. Budget talks between Democrats and Republicans ground to a halt over the weekend in a dispute over immigration policy. A repeat of the 35-day shutdown that started before Christmas could cause hundreds of thousands of federal workers to again be furloughed. 3. Brexit bites: The British economy grew 0.2% in the final quarter of 2018, compared to the previous three months, according to data published Monday. “As the drag on growth from Brexit uncertainty is only going to be bigger in [the first quarter], there’s little hope of a rebound early this year,” said Paul Dales, chief UK economist at Capital Economics. The pound dropped 0.4% against the US dollar on Monday, slipping below $1.29. 4. Global market overview: US stock futures were pointing higher. European markets opened with gains, while stocks in Asia were mixed. US stocks notched another win last week despite investor jitters over trade tensions. The Dow Jones industrial average closed down 0.3% on Friday, while the S&P 500 and the Nasdaq added 0.1%. 5. Earnings and economics: Loews Corp (L), Meredith (MDP) and Restaurant Brands International (QSR) will release earnings before the open. Moneygram (MGI) will follow after the close.